Robotic process automation (RPA) has gained significant momentum this year. Providers like UiPath, Blue Prism, and others continue to gain huge market shares and company valuation as organizations realize that RPA creates a path toward AI and simplifies the most complex processes. For RPA to progress beyond automating simple repetitive tasks with fixed rules, enterprises will need to turn their RPA robots into “smarter” robots that can process a wide variety of unstructured content, effectively replacing employees from the manual work of processing information trapped within documents. These higher value use cases move RPA to the next level of intelligent automation where robots rely on a new set of digital automation skills to identify and learn documents over time, read and extract data, all of which is supported by machine learning and AI technology. Enterprises have been striving toward better process management and operational efficiency for years, so how exactly is the new wave of intelligent automation different, and why does it matter now? Here are a few points to think about and the role robots will play in a smarter more powerful digital workforce. As adoption of RPA accelerates and matures, organizations are finding more business processes that can utilize software robots—everything from eliminating data entry tasks, collecting data from disparate sources, to cross-checking and validating information. In fact, by 2021, Forrester estimates there will be more than 4 million robots doing office and administrative work as well as sales and related tasks. Also driving the growth in robot usage is enterprises wanting to automate content-based processes. These types of processes tend to be more complex given the content itself is often unstructured and must be turned into meaningful structured information. These types of use cases are where we find enterprises looking for direction and guidance around technologies and solutions, which brings us to content intelligence. Content intelligence brings new meaning and opportunity for organizations to apply intelligence to their content and connect it to their business processes. Content intelligence is artificial intelligence (AI) for documents and brings together several cognitive technologies including OCR, machine learning, and text analytics to deliver solutions for creating structured information from unstructured content. The benefits organizations can achieve with content intelligence is quite significant. It increases operational efficiency in terms of speed and accuracy as robots use content intelligence to fully automate a document process including classification, extraction of data, and understanding the meaning of information, while only relying on humans to handle exceptions. The robot can then easily act on that structured information by updating systems, notifying customers and alerting employees when exceptions arise. Without knowing what the content is and its purpose, the robotic process itself stops dead in its track. The push toward the democratization of AI is growing. Enterprises are eager to understand how they can move RPA to the next level of automation and when to incorporate other solutions into RPA to automate more complex processes and drive greater business benefits. It is a journey not a sprint, so for enterprises to grow and expand the use of RPA within an enterprise, robots must become smarter and have access to the right skills. RPA has served as a good starting point for automation, but it should not stop there. It is part of a digital transformation journey that starts and grows over time where robots leverage additional intelligence skills to solve more complex processes. More than just a new wave of technology, RPA has raised the automation bar for many enterprises and brought business groups back to the table to show where they are struggling with their processes. 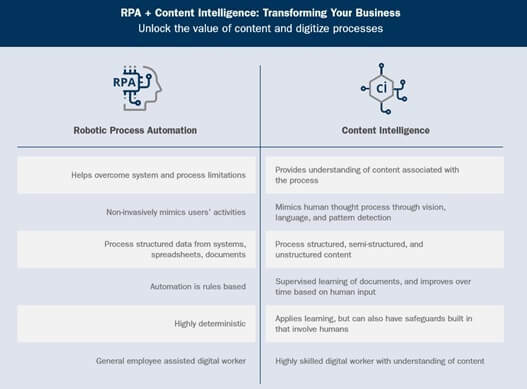 Some activities are simple enough to automate with RPA because they are repetitive and rules based, but RPA has highlighted many of challenges organizations still face when it comes to automating content centric processes. This where OCR, machine learning and other AI technologies have been integral to the broader use and adoption of RPA. Content intelligence is helping organizations transform their business by giving robots the next set of intelligent skills to handle a wider array of use cases. At all levels of RPA starting with the most basic automation robots all the way to designing robots that automate tasks involving more intuition, judgement and problem solving. It also allows your processes to identify and understand your content, which is key to the success of any digital transformation initiative. It is especially critical to improving the customer experience by simplifying tasks like customer on-boarding, enrollment, on-line applications, interactive communications and other customer facing services, where automating the understanding of content and judgment can have a significant impact to your customers. Every enterprise is interested in knowing how and where to apply AI. A good starting point is in processing documents, images, text and communications. Focusing on unstructured content, enterprises can leverage vision and machine learning technologies to deliver the flexibility and scale required to handle thousands of document variations. The end result will be enterprises having a highly adaptive system that can be applied to invoices, sales orders, contracts, mortgage lending, claims and more. What started out only a few years ago with robots automating simple tasks has now moved into the next phase of intelligent automation, where content intelligence automation skills are central to the next generation of digital robots. The new digital workforce is already having a significant impact on transforming the way companies do business, compete and excel in the marketplace. Next, enterprises need to consider how their automation teams embrace and understand where and how to apply content intelligence.